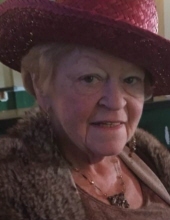 Kathleen A Pyne, 73 of Morristown and Randolph, died on Thursday, January 31st in her home. She was the only daughter (out) of 7 children from the late Rowland Lucid Sr. & Kathryn Lucid. Wife of the late John (Jack) Pyne and sister to the late Kevin, William & James Joseph Lucid. She is survived by her three children Sean and Joseph Pyne of Morristown, Tara Bartz and her husband Tom Bartz and her 3 grandchildren John, Michael and Sarah Bartz of Washington, NJ and her 3 remaining brothers Rowland Lucid Jr of Morristown, Robert & Mary Lucid of New Providence, Stephen & Jody Lucid of Morristown, her many nieces & nephews along with many many friends. Kathleen was born in Jersey City, but spent most of her life living in Morristownship. She attended St. Virgils & Bayley Ellard catholic schools. She worked at Sears & Roebuck, The Horseman Insurance company, AT&T and spent many years waitressing as well - where she was known fondly as Kate/Katie by many who loved her. A Mass of Christian Burial will be celebrated on Wednesday 2/6 at the Church of the Assumption, Morristown at 10AM. Hours of visitation at the Doyle Funeral Home, 106 Maple Ave., Morristown on Tuesday 2/5 from 4-8PM. The family requests that in lieu of flowers donations in her memory be made to the Juvenial Diabetes Foundation www.jdfmumbai.org. This is a disease that has touched many members of our family, along with all in the world that suffer from it. To send flowers or a remembrance gift to the family of Kathleen Pyne, please visit our Tribute Store. "Email Address" would like to share the life celebration of Kathleen Pyne. Click on the "link" to go to share a favorite memory or leave a condolence message for the family.